SiteGround is a professional and expert WordPress hosting provider. They allow you to choose servers from any one of their 3 highly secured different data centers located across the globe. All of their web servers are specially optimized for WordPress applications speed and security. They also provide automatic WordPress core and plugin updates, WordPress Staging and Pre-Installed Git, unique “SuperCacher” technology for an ultra-fast website, and top-level 24*7 customer support. Currently they’re offering UpdatedReviews users an exclusive 60% off discount on their startup web plan including shared and wordpress hosting. Utilize our exclusive SiteGround coupon code mentioned below to grab a free new domain name and flat 60% off their web hosting packages. Read SiteGround Reviews from Experts. Expiry 31st March 2019. Visit now. This is our exclusive SiteGround hosting offer that gives flat 60% off shared hosting plans. Recommend to sign up for longer duration to make the most of this amazing deal. Use our exclusive Siteground Cloud Hosting Coupon code to save 10% on Their cloud hosting plans. The coupon code will be applied automatically when you hit the “Get Deal” Button. The given link will activates the offer, and clearly displays that the discounted deal is activated. Now the Shared Hosting Offer at SiteGround.com is activated. 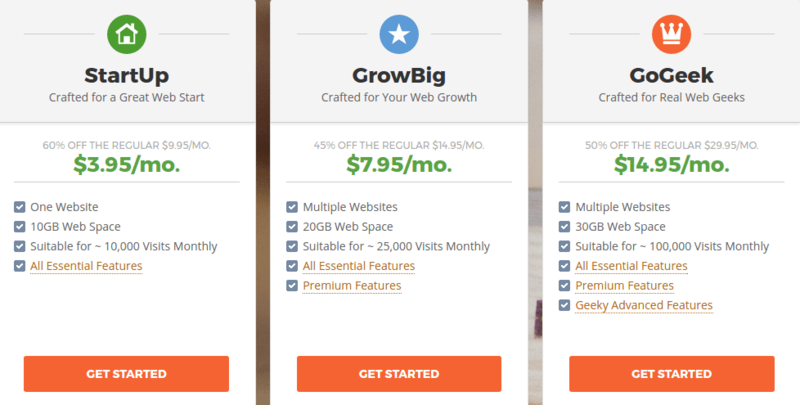 Siteground StartUp plan offers 60% off, their GrowBig offers 45% off, and their GoGeek Plan 50% off. Despite the discounts varying a little between hosting plans. Now you can see an overview of all the various plans and features and a very helpful info as to how much traffic monthly they are designed to handle. Once you have decide with they plan, just click the “Get Started” button. As all their Web Hosting plans comes with a free domain stated to be worth flat $14.95/yearly, but if you watch around you could get a domain name for much economical than this. Although we at UpdatedReviews tend to retain our domains in one place with a best domain name registrar like Bigrock or HostingRaja, there is no particular reason not to take benefit of a free domain registration. If you don’t need a free domain name, just choose “I already have a domain” option then enter your domain and proceed to the next step. In this step , you will be able to see a secure order form where you can fill out your information such as your email id, desired password for your new account, first and last name and other contact information, enter your payment details and opt to purchase extras such as HackAlert Monitoring. Once you have filled out all the required information and checked the terms & condition option, click “Pay Now” to purchase your Siteground hosting plan. All done! Now your account is ready and you can start creating your website.